Brac Apartments Pucisca are in Pucisca on Brac, on the hill above the bay, about 300 m from the sea and a five-minute walk from the village center. The house contains three apartments of different sizes, each with its own entrance, and although each apartment is rented as a separate unit, you can rent the entire house for a larger group of family or friends, as it can sleep 10-13 people altogether. 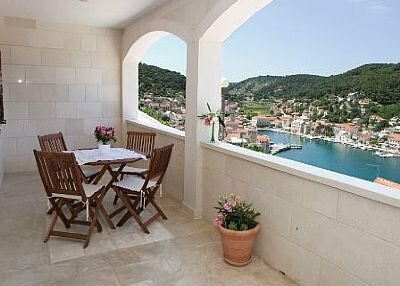 All three of our Brac apartments have a wonderful view of the sea, Pucisca on Brac and the entrance to the bay, thanks to their position on the hill above the bay. To make your stay on Brac Island as pleasant as possible, we have equipped the apartments with all the equipment you might need and the interior and grounds have been tastefully designed. Each apartment has air-conditioning. Apartment A2 + 2 sleeps 4 and consists of a kitchen/sitting room, bedroom, bathroom and covered balcony. Brac Apartments Pucisca were built and fitted out in 2003. The stone in this area is different from any other stone. Builders throughout history have recognised its quality, as have many others who have exported it to far-flung corners of the world and incorporated it into their buildings. And everyone who visits Pucisca on Brac, the capital of Brac stone, will notice it too.